Saab Top 10 Dressage 2-3 December 2017. Saab Top 10 Dressage is a new exclusive competition for the best riders in the world. And it brings at the same time a new and exciting format to the dressage sport. It will take place during Sweden International Horse Show the first weekend in December. -We have talked about a Top 10 for the dressage in many years and it’s fantastic that it is now a reality, says the number one on the world ranking list, Isabell Werth (GER), at a press conference about the competition. The Swedish top rider Patrik Kittel is one of the brains behind the new concept and he explains his intentions like this. – Our goal is to present the very best the sport has to offer. We want fierce competition amongst only the very best. 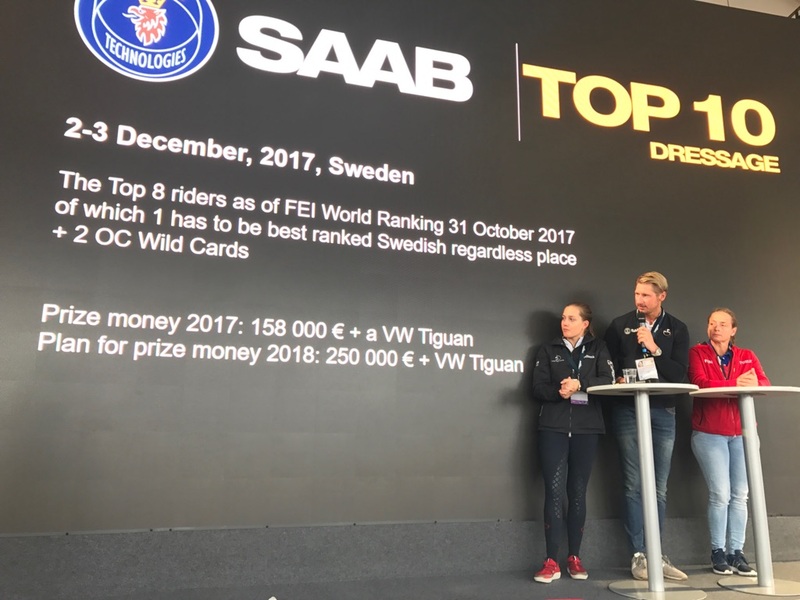 Prestige and money – Saab Top 10 Dressage brings the big prize money to the sport. – Thanks to the sponsor Saab we can now present really big prize money to the sport, something we have lacked earlier, says Patrik Kittel. The Friends Arena in Stockholm has a seating capacity of 18 000 spectators and close to 90 000 people are visiting the show over four days. This makes it the largest indoor show in the world. – It is an amazing arena to compete in. The support and engagement of the big audience is unbeliveble, top Danish rider and EC silver medallist Cathrine Dufour (DEN) says.